We all accumulate an abundance of possessions we can't seem to part with even though we don't use them regularly. Often those items end up at a Scottsdale commercial storage facility where you pay to secure that property month after month. When it's time to retrieve property or add more items to the storage unit, you discover the padlock that is securing your valuables is worn or rusted due to weather exposure. Maybe you've lost the key or forgotten the combination. Now your property is secured even from its rightful owner – you. Or as the owner of a Scottsdale storage facility, you may have occupied units that are no longer generating monthly rental payments. Before it cuts too deep into company profits, it's time to contact Adams Locksmith to chop the lock so you can make that unit profitable again. Sometimes the desire to keep our property safe creates some minor inconveniences. Have you ever pad- locked a breaker box or some other compartment to which you don't regular require access only to discover you've forgotten or lost the combination on the one occasion when you need it most? Maybe the key is buried deep within that utility drawer everyone has in their Scottsdale home. It could be a personal or commercial Scottsdale storage shed, a tool box or a locked fuse box which was innocently secured that now provides a big problem if you cannot access it when needed. Either way, Adams Locksmith, serving commercial or residential properties in Scottsdale, Paradise Valley, Carefree, Northeast Phoenix, Mesa and Tempe, can ensure that you won't remain locked away from your valuable property and the cost to regain entry won't further dampen your day. 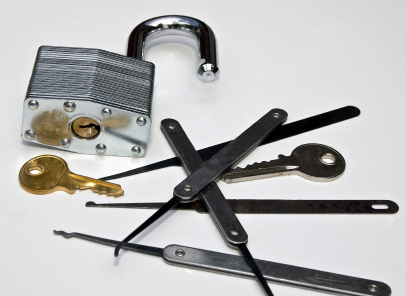 You can expect professional and efficient service from the technicians at Adams Locksmith.